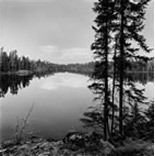 One of the most widely admired landscape painters in America, Tom Uttech merges 19th-century notions of the ideal landscape with aspects of surrealism and photo-realism to create his unique vision of the North Woods. The artist re-establishes the wilderness as a mystical and magical place where the animal kingdom reigns, the colors of nature flourish and the various forces of nature are played out. Uttech is inspired by the prairie and northern woods of Wisconsin, and his numerous camping and canoeing trips to northern Minnesota and Quetico Provincial Park in Ontario, Canada. Uttech's paintings are distinguished from those of most contemporary landscape artists in that he does no drawings, studies or photographs while on these excursions. His paintings are studio inventions based entirely on memory and improvisation. Uttech's landscapes have been described as "pure fantasy and, at the same time, absolutely true to nature." His use of high-key colors and his depictions of seemingly airless environments give his work a surreal quality. The intricate detail achieved through the artist's precise painterly touch gives the surfaces of his work a high degree of patterning and articulation. More recently, Uttech has begun to add painted or carved elements to his handmade frames, which are now integral components of his work. In addition to paintings, the retrospective also features a selection of prints and photographs by the artist. A Wisconsin native, Uttech received his bachelor's degree at the Layton School of Art in Milwaukee and his M.F.A. from the University of Cincinnati, Ohio. He was a professor of art at the University of Wisconsin-Milwaukee from 1968 until 1998, when he decided to devote himself to his painting full-time. This exhibition continues the Milwaukee Art Museum's commitment to showcasing the work of Wisconsin artists. The exhibition is organized and curated by Margaret Andera, MAM associate curator. A full-color catalogue accompanies the exhibition. The exhibition is sponsored by We Energies as part of "A Celebration of Nature." Tom Uttech, Nin Kabikawa, 2002. Oil on canvas. Courtesy of the Alexandre Gallery. Tom Uttech, Dream Net, 1987. Oil on canvas. Lent by Northern Trust Bank, Chicago. Tom Uttech, Onimik Sagaigan, 1974, printed 2004. Pigment inkjet print. Lent by the artist. Tom Uttech, Bimawanidiwag Awessiiag, 1996. Oil on canvas. Lent by Ruth Mutch, Sheridan, WY.